When The Astronomer’s friend and high school classmate Sara heard that sushi ranked near the top of our favorite foods list, she immediately hooked us up with the former corporate general manager of Nobu Matsuhisa‘s empire, whom she met a few years ago while working at Nobu in New York City. 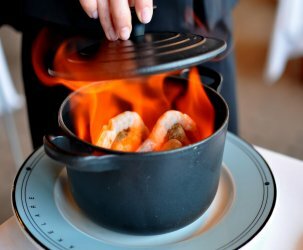 Luis Decasas recently opened Tiger in Beverly Hills. Thanks to our friend in common, The Astronomer and I were invited to swing by Tiger for a lovely dinner on the house. 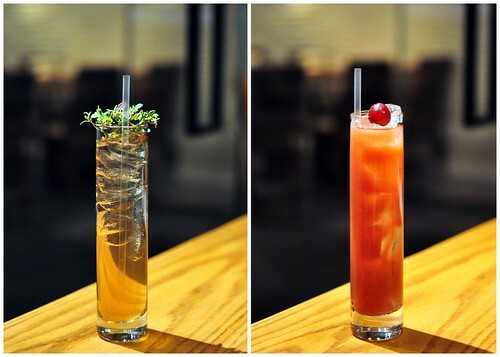 After walking past the slew of swanky eateries along Canon Drive, we arrived at the former Lucky Fish space. I loved how the restaurant had two distinct and equally appealing vibes. 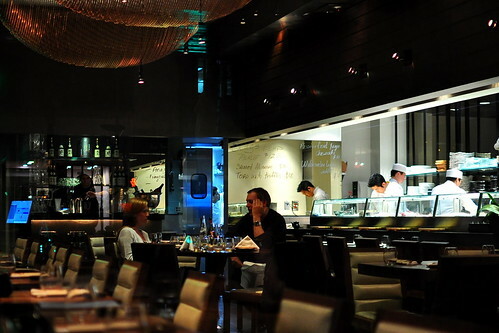 Tiger’s main dining room was sleek, cool, and subtly glamorous. The brightly lit kitchen gave eaters full view of the chefs slicing and dicing. The outdoor space was more laid back; the abundance of wood furniture and accents brought a Zen-like quality to the room. 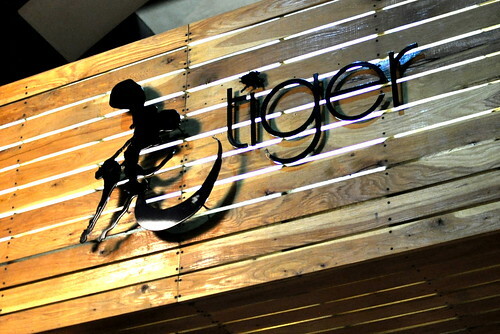 Tiger’s kitchen is headed by yet another Nobu alum, Jon Maza. The former Nobu Bahamas chef was born in Hawaii and began apprenticing with a Japanese sushi master at the age of fourteen. 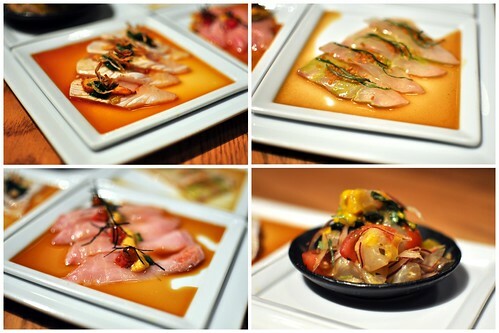 Chef Maza showed so much promise at Nobu that Luis wooed him away to work his magic at Tiger. Our evening began with two tall and skinny cocktails. The Tiger Saketini ($6) with rock sake junmai, thyme, and rosemary was wonderfully fragrant, but a little on the sweet side. The spicy grape number ($6) was more to my liking. Made with soju, freshly pressed grapes, habanero, and vanilla, the cocktail packed a lot of deep heat. The chef sent out four “cold dishes” to start. Clockwise from top left—seared kampachi with yuzu soy, chantrelle mushroom, and fried shallots ($16), tai umami jime with thai basil and dried miso ($14), hirame ceviche ($14), and kinmedai sashimi with ume shiso ($18). Each sliver of fish was fresh and fabulous. 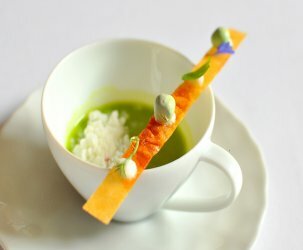 The tai was our favorite due to its salty and herbaceous accompaniments. An array of tempura-battered items arrived soon after. Each of the four bites was paired with sauces that enhanced its flavors and textures. 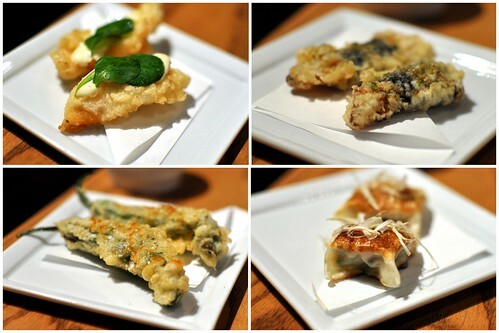 Clockwise from top left—hirame tempura with apple aioli ($12), unagi tempura with buttermilk sauce ($12), lobster gyoza with Korean sauce (daily special), and shishito tempura with edamame sauce ($6). The lobster dumpling paired with gochujang surpassed the crisply coated trio by a hair. 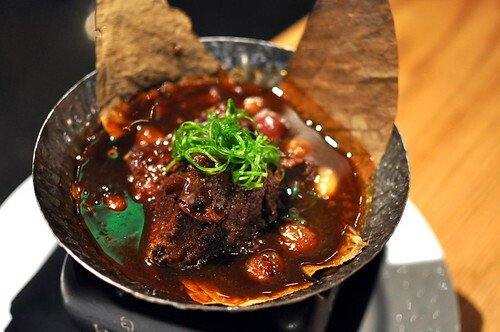 From the “hot dishes” menu, the chef sent out a bubbling short rib stew ($22) with cigar leaf and pearl onions. The meat was luxuriously tender and heartier than anything I’ve ever eaten at a Japanese restaurant. The Astronomer would’ve appreciated a bowl of rice to eat with it, but I was happy with the chef’s vision. To cleanse our palates, the chef sent out a watermelon sorbet with diced mangoes and lychee foam. It was just the thing to transition from savories to sweets. To finish, a trio of excellent desserts. The Astronomer went gaga over the goat cheese doughnuts ($8), while the awesomely salty amaretto white chocolate mousse with praline pear cookie crunch ($8) had me smiling. The passion fruit yuzu cheesecake with creme friache ($8) wasn’t too shabby either! Tiger is exceptionally well priced given its neighborhood and level of quality. Even though we sampled a lot of different menu items, there’s still so much left to taste. Next time around, the strip loin and foie gras robatta will be mine. now that’s some connections! spicy cocktails are the best..
rawrrrr cathy rawwrr…the desserts sound divine. i want some lychee foam! Where did the carb love go, Cathy? Where oh where? Diana – She is still here! 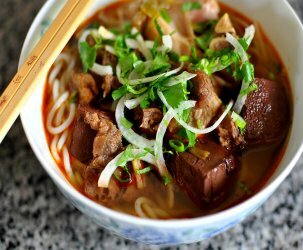 I was totally stuffed by the time the short rib stew came around. Eating it carb-free was just fine! Sensational looking food. Shame it would take me 14 hrs to get there! Looks like a tasty meal. 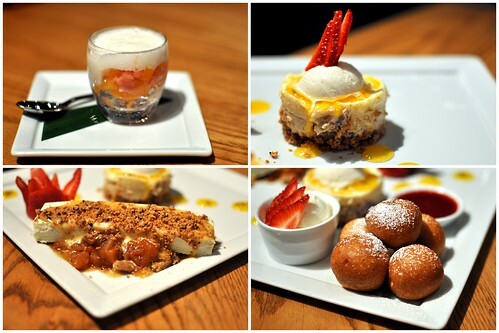 The desserts looks damn good!